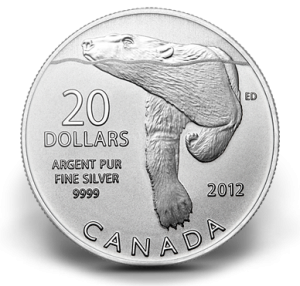 Shown on the reverse of the coin is a design by Emily S. Damstra which depicts the iconic polar bear swimming in water. The head of the creature is just above the surface. To the right are the initials of "ED" for the designer while the inscription of "$20 DOLLARS" and "ARGENT PUR FINE SILVER 9999" are to the left. Below is the inscription of "CANADA." The obverse depicts Susanna Blunt's portrait of Queen Elizabeth II of England. That portrait is surrounded by the inscriptions of "ELIZABETH II" and "D G REGINA." The coin is legal tender of the country of Canada and features a face value of twenty dollars. As previously noted, it is also sold for that exact amount from the Royal Canadian Mint. If the previous two releases in the "Exchange $20 for $20" series can be any indicator, these coins will not last long. The series debuted earlier last year with a $20 Pure Silver Maple Leaf Commemorative Coin which featured a maximum mintage of 200,000. Collectors snapped up the entire mintage in just twenty-nine days despite being initially only sold in Canada and a household order limit of three coins. That first strike was followed in October of 2011 with the $20 Pure Silver Canoe Commemorative Coin. Like the first coin of the series, this one also sold out in a matter of days - thirty four to be exact. The strikes were also limited to a household order cap of three but featured a larger mintage of 250,000 coins. This newest release in the series, the Polar Bear Commemorative Coin lists the same maximum mintage of 250,000 as well as the household limit of three coins. Just how many days before it sells out is anyone's guess, but it is likely to not be many. 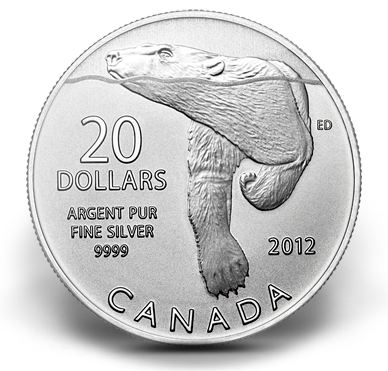 Each Polar Bear Commemorative Coin is struck to specimen quality from the 99.99% pure silver. The coins have a diameter of 27mm and a weight of 7.96 grams. That is approximately equal to one quarter ounce of the precious metal.